Just a short ferry ride and you’re there, surrounded by rocky shoreline, towering Douglas firs, and majestic twisted Arbutus trees. You won’t find a single high-rise tower or trendy condo complex. The only traffic you will encounter is the lineup of cars departing the ferry with kayaks and Thule racks on top. You can smell and taste the salty sea air. You can hear the ocean waves crashing against the rocky shore. Eagles soar in the breeze and otters scamper along the coastline. Camping. Make your home under the towering firs at Montague Harbour Provincial Campground, just a short walk to the beautiful white shell beach. And as the sun sets, spread your blanket on the beach and watch the western sky turn brilliant shades of orange, red, and yellow. Kayaking. 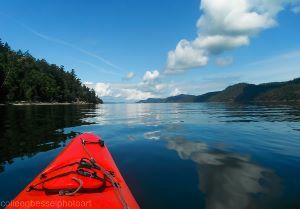 Slip your kayak into the waters right off the shore. Hear the splash of your paddles as you explore the islands and channels off the harbor. If you don’t have your own kayak, you’re in luck — rentals or guided tours are also available. Hiking. Savor the peace and tranquility of the wooded forest floor or climb to the top of the rocky ridges that surround the island for sweeping ocean vistas. Beaches and Parks. Frolic in the crystal clear waters of Montague’s white shell beach. Count the starfish in the shallow water of Morning Beach. Explore the caves at Retreat Cove. Or watch the ferries wind through Active Pass far below your perch on top of Bluff Park. Saturday Market. 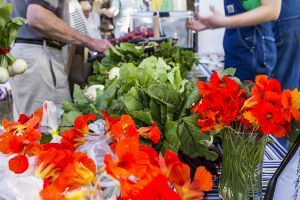 Make your way to Lions Park for Galiano’s Saturday Market. Grab a piping hot cup of Salt Spring Coffee and a fresh-baked scone. Stock up on garden-fresh vegetables. Check out the local artists and artisans and pick up a unique souvenir or gift. Meanwhile the park is abuzz with music, a party in the making. Art Galleries Galore. 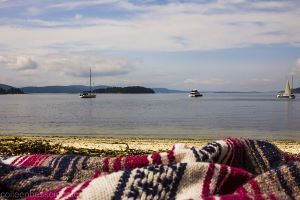 Galiano is renowned for its vibrant and prolific arts scene — paintings, photography, pottery, glasswork, jewelry, and more. If you love art, visit during the long weekend in August when the island’s artists open their doors and host their annual shows. Eating. Galiano does not forget or disappoint the food lovers. Enjoy fresh wood-fired pizza straight from the oven at the Galiano Inn. Hop on the Hummingbird Pub bus for an evening of merriment complete with live music most weekends. At Wild1 local chef Orion Finnie adds fresh herbs to his delicious Thai dishes. Or discover a constantly changing menu of shared plates using local ingredients at pilgrimme. Try a heaping plate of the world’s best nachos on the deck of The Sea Blush Café overlooking Montague Harbour.